The aesthetic movement of the late 1800’s held that all the objects which surround us should be beautiful and functional. Probably in that order. After all, the aesthete required that all his senses be entertained. It is a seductive philosophy. When it comes to mechanical pencils, it is function which normally follows form. And form is frequently dictated by comfort. Writing in longhand is a physical as much as a mental act. But, who’s to say that something as pedestrian as the pencil can’t be a work of art? Especially if it is crafted by Caran d’Ache. Add engraved initials and you have a personalized work of art with which to create your own works of art. I carry a far less expensive, but every bit as satisfying to write with, ballpoint version of their classic 849. Pick one up here. 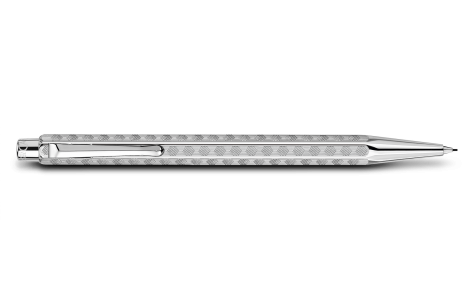 This entry was posted in Uncategorized and tagged 849 Original Ballpoint, Caran D' Ache Retro Ecridor Silver Plated/Rhodium, Caran d'Ache, gifts, Mechanical pencils, Swiss-made.. Bookmark the permalink. 2 Responses to Write, Beautifully. Elegance is often revealed in the details of one’s life. This pencil is something that Mrs. E. can cherish for years to come and every time she uses it, she will think of you. If one of her friends notices the pencil, it will give her an opportunity to brag about her wonderful husband. Mrs. E. did receive the perfectly elegant gift for her ‘demi-centarian’. Both of us are with you on the writing subject and have quite a valuable collection, which we actually use! Sending you best wishes for a good spring and many happy birthdays to be celebrated together!